Big numbers of BC cherries are being popped into the mouths of fruit-lovers in China, after travelling along the Pacific Gateway’s transportation routes. Since 2004, the amount of cherries shipped to countries like China has grown an astonishing 193%. This was recently fueled by a 2014 agreement between the Governments of China and Canada, to allow cherry shipping to Mainland China, after a successful 2013 pilot program. (Previously, Chinese regulations allowed only Hong Kong and Taiwan to import BC cherries). In 2004, 2,750 tonnes of the juicy fruit were exported. Ten years later, about 8,060 tonnes of cherries travelled beyond our borders. 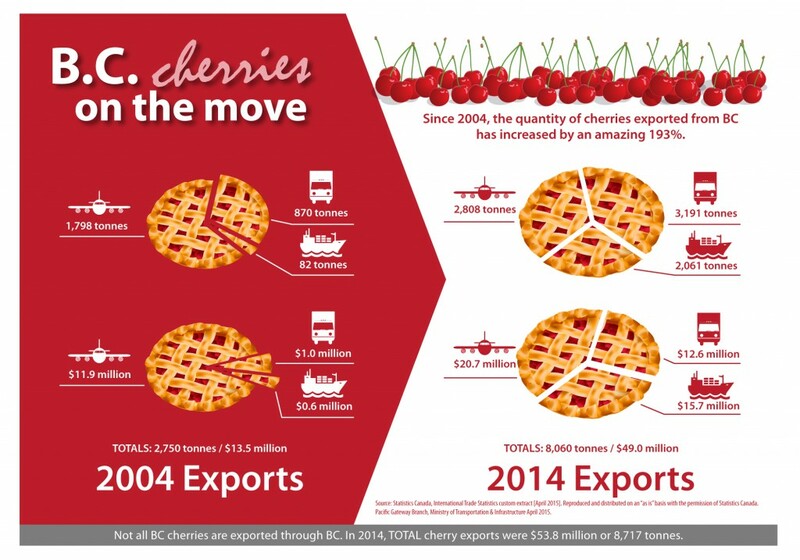 The tonnes of cherries that travel from BC to Asia via ship (vs. aircraft) have grown from a small sliver of the trade to about a third of the pie. This is good news for cherry producers who can ship the fruit more economically by sea than by air. What makes cherries so popular in Asia? The delectable fruit is a favourite during the Mid-Autumn Festival, also known as the Moon Festival. Happily for BC cherry growers, the ripening of BC cherries coincides with the event. BC is the biggest producer of sweet cherries in Canada, accounting for almost 89% of Canada’s crop. Getting more BC cherries to China was part of ongoing efforts by BC agrifood producers and the provincial and federal governments to ship more “grown in BC” products overseas. BC agrifood exports have risen significantly due to our reputation for high food safety standards, lower shipping costs and excellent ties to Asia-Pacific markets. The cheery cherry story is the kind of success that the Pacific Gateway Program is supporting, as it makes transportation infrastructure improvements that capitalize on BC’s geographic proximity to strong Asian economies. Since 2005, the Ministry of Transportation and Infrastructure has been working with other governments, ports, airports, rail lines, commercial haulers and public and private stakeholders to make BC a hub of transportation activity – a network of ships, trains, planes and trucks all working together seamlessly. We’re pleased that BC’s scrumptious cherries are prized internationally, bringing profits to cherry producers and those who involved in cherry production and transport. The fact that transportation plays a role in benefiting BC’s economy is the cherry on top for us.